Next Generation Product Concept Trends from Croda Inc. 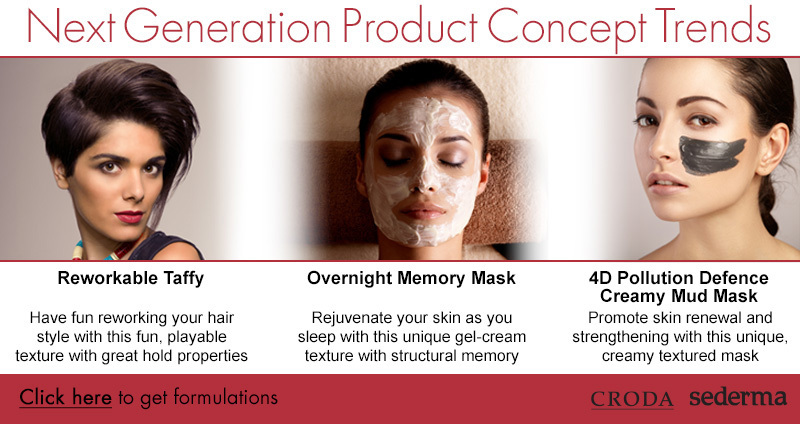 The rise of at-home beauty trends has led to increased popularity of novel formulations with unique sensory benefits and playful textures to enhance consumer beauty routines. We developed formulations that are inspired by product concepts that are on trend, with textures that will be a hit this year and beyond! Croda’s Reworkable Taffy allows you to have fun reworking your hair style with a playable texture and film formation for great hold properties. Croda’s Overnight Memory Mask rejuvenates your skin as you sleep with a pampering gel-cream texture and structural memory which enables the formulation to recover to a smooth “first touch” appearance. Sederma’s 4D Pollution Defence Creamy Mud Mask promotes skin renewal and strengthening with an airy, cream texture that holds moisture and delivers a soft, velvety and non-greasy skin feel. Click here to get these formulations.